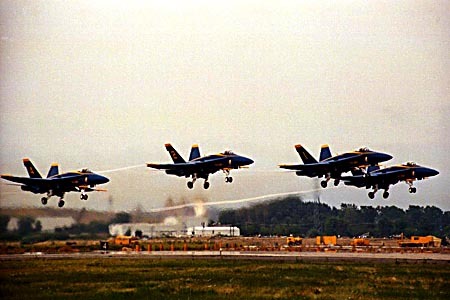 I was listening to the radio, and heard that the Blue Angels were staging the Chicago Air and Water Show out of Glenview Navel Air Station. Not only that, but the public was invited to go there. So instead of fighting the crowds around Oak Street Beach (which I'll admit I wouldn't do anyway,) I decided to go up to Glenview. Who wanted to see the water portion of the show, anyway? Not only was it less crowded than the lakefront, but you were about 100 yards from the runway. The aerobatic teams may not have done a full show, but they did a partial low-show, and the high speed passes were awe inspiring. It was an overcast day and I used a high speed film so I could use a high shutter speed and still have some depth of field, since focusing is pretty hard when your subject is going past at a few hundred miles per hour. I thought I was pretty successful, but there's a lot of graininess in the negative scans, and consumer film in 1992 was either miserable, or they just haven't held up well over time. I've had color shifts I've had to correct. All pictures were taken with the F3, and probably my 70-210 Vivitar Series One lens.